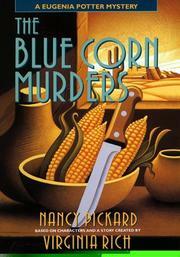 The Blue Corn Murders ($21.95; Aug. 14; 272 pp. ; 0-385-31224-5): Pickard takes time off from her Jenny Cain series (Twilight, 1995, etc.) to provide a second posthumous encore for Rich’s chef-sleuth Eugenia Potter, whose Colorado vacation is interrupted by a pair of murders, the disappearance of a busload of children, and a dozen recipes.